A large group of school children in New Zealand have honoured their beloved teacher by performing the traditional dance, the haka, as his hearse rolled into the school for the funeral. 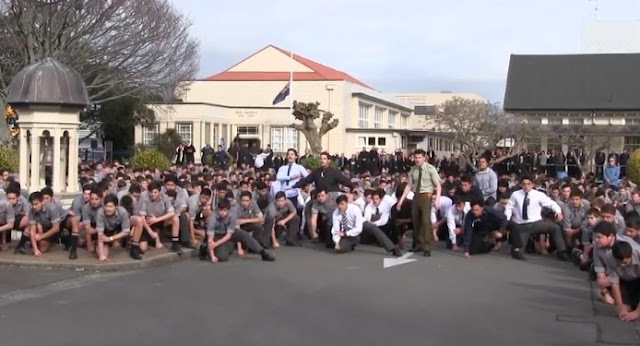 At least 1,700 boys at Palmerston North Boys' High School on New Zealand's North Island participated in the epic performance for their physical education and maths teacher, Dawson Tamatea.Tamatea, 55, died in his sleep on July 20, according to TVNZ. He had been a teacher at the school for almost 30 years. "This was a very emotional and powerful performance," the school wrote on its YouTube channel. "We are extremely proud of our boys' performance and we know that Mr Tamatea would be too." The haka has become renowned internationally due to its prominence in rugby union football, where it is performed as a war cry before matches played by New Zealand's teams. A different variation of the traditional dance, normally carried out by men, is also used at important events, to honour respected guests and also at funerals. The participants stamp their feet, slap their hands and contort their faces, all while groaning loudly. It was a fitting tribute to say good bye to the respected teacher. Responses to "Emotional farewell as students perform haka dance at teacher's funeral"
So moving and what a great way to honor a well loved teacher!! I got teary eyed, what an honor! This is beautiful what an inspiration to see the youth honor their elder this way. It was beautiful.